New ultra-compact 80GHz system delivers fiber speed performance, highest system gain, CPRI Mode 7 support, and lowest TCO for backhaul and fronthaul networks. Our new Flex4G-10000 delivers fiber capacity with AES encryption while it dramatically lowers the cost per megabit compared to fiber. BridgeWave Communications, a market leader in wireless point-to-point systems, today announced the Flex4G-10000 millimeter wave (80GHz) radio system that delivers up to 9.7Gbps capacity, 256-bit AES encryption for highest data security, and the highest system gain to ensure maximum throughput at the longest distances. The Flex4G-10000 offers mobile network operators a much lower cost alternative to fiber in macro/cell backhaul and fronthaul for Centralized Radio Access (C-RAN) networks supporting up to CPRI Mode 7 (9830.4Mbps), while offering ISPs, enterprises, and government agencies a much lower cost alternative to fiber. 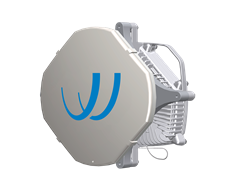 BridgeWave Communications offers a broad portfolio of backhaul solutions including licensed 6-42GHz microwave systems; license-free 60GHz millimeter wave systems; and lightly-licensed 80GHz millimeter wave systems, including the new Flex4G-10000. These systems have been designed specifically to meet the backhaul needs of carriers, enterprises, and ISP customer networks worldwide. REMEC Broadband Wireless Networks LLC dBA BridgeWave Communications provides high-capacity microwave and millimeter wave backhaul and wireless connectivity solutions to operators, carriers, service providers, governments, and private enterprises. With nearly one million radio systems deployed in more than 60 countries, the company’s innovative solutions have been entrusted by customers to enable highly reliable and secure, high-capacity, gigabit connectivity while reducing operating costs relative to fiber. REMEC/BridgeWave is headquartered in San Diego, California, and is part of the Moseley group of companies. For more information, visit http://www.bridgewave.com.